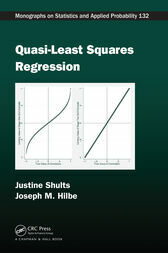 Drawing on the authors’ substantial expertise in modeling longitudinal and clustered data, Quasi-Least Squares Regression provides a thorough treatment of quasi-least squares (QLS) regression—a computational approach for the estimation of correlation parameters within the framework of generalized estimating equations (GEEs). The authors present a detailed evaluation of QLS methodology, demonstrating the advantages of QLS in comparison with alternative methods. They describe how QLS can be used to extend the application of the traditional GEE approach to the analysis of unequally spaced longitudinal data, familial data, and data with multiple sources of correlation. In some settings, QLS also allows for improved analysis with an unstructured correlation matrix. Special focus is given to goodness-of-fit analysis as well as new strategies for selecting the appropriate working correlation structure for QLS and GEE. A chapter on longitudinal binary data tackles recent issues raised in the statistical literature regarding the appropriateness of semi-parametric methods, such as GEE and QLS, for the analysis of binary data; this chapter includes a comparison with the first-order Markov maximum-likelihood (MARK1ML) approach for binary data. Examples throughout the book demonstrate each topic of discussion. In particular, a fully worked out example leads readers from model building and interpretation to the planning stages for a future study (including sample size calculations). The code provided enables readers to replicate many of the examples in Stata, often with corresponding R, SAS, or MATLAB® code offered in the text or on the book’s website. "The book does an excellent job of explaining basic concepts and techniques in the analysis of longitudinal and correlated data using QLS and GEE. Well-chosen data examples almost follow all the technical explanations, providing the readers a flavor on what problems QLS solves and how to solve those problems using software. Although the authors mainly use Stata to demonstrate the examples, they also provide web access to R, SAS, and MATLAB code and guidelines to replicate those examples, making the book appealing to a wide audience. The book also successfully incorporates some recent research work without raising its technical level. Therefore, the book will serve as a comprehensible guide to researchers who conduct analysis on correlated data. It would also be a good textbook for graduate students in statistics or biostatistics. Finally, I believe it would be a popular desk reference for methodology-oriented researchers who are interested in longitudinal studies and related fields." "This book deals with the quasi-least squares (QLS) regression, presenting a computational approach for the estimation of correlation parameters in the context of the generalized estimating equations (GEEs). … The book is provided with illustrative examples for each topic." Justine Shults is an associate professor and co-director of the Pediatrics Section in the Division of Biostatistics in the Perelman School of Medicine at the University of Pennsylvania, where she is the principal investigator of the biostatistics training grant in renal and urologic diseases. She is the Statistical Editor of the Journal of the Pediatric Infectious Disease Society and the Statistical Section Editor of Springer Plus. Professor Shults (with N. Rao Chaganty) developed Quasi-Least Squares (QLS) and was funded by the National Science Foundation and the National Institutes of Health to extend QLS and develop user-friendly software for implementing her new methodology. She has authored or co-authored over 100 peer-reviewed publications, including the initial papers on QLS for unbalanced and unequally spaced longitudinal data and on MARK1ML and the choice of working correlation structure for GEE. Joseph M. Hilbe is a Solar System Ambassador with the Jet Propulsion Laboratory, an adjunct professor of statistics at Arizona State University, and an Emeritus Professor at the University of Hawaii. An elected fellow of the American Statistical Association and an elected member of the International Statistical Institute (ISI), Professor Hilbe is president of the International Astrostatistics Association as well as chair of the ISI Sports Statistics and Astrostatistics committees. He has authored two editions of the bestseller Negative Binomial Regression, Logistic Regression Models, and Astrostatistical Challenges for the New Astronomy. He also co-authored Methods of Statistical Model Estimation (with A. Robinson), Generalized Estimating Equations, Second Edition (with J. Hardin), and R for Stata Users (with R. Muenchen), as well as 17 encyclopedia articles and book chapters in the past five years.